Once you get to arena 4, you are able to utilize the Hog Rider + Freeze combo. Keep a lookout for the Freeze epic card in the shop if you can’t get them from your magical chests. This is a good deck and your win condition is very simple – get that one crown win and defend against enemy sieges. This deck works from arena 4 all the way to legendary arena 8. But to climb higher, you need to max out your cards. Let’s go over the deck you should be using. You are welcome to tweak the deck to whatever you like. The good thing about this deck is that the only epic card is freeze. While freeze is epic, the upgrades only increases the freeze time by 0.3 seconds for each level. That means, you will be fine even if its level 1. 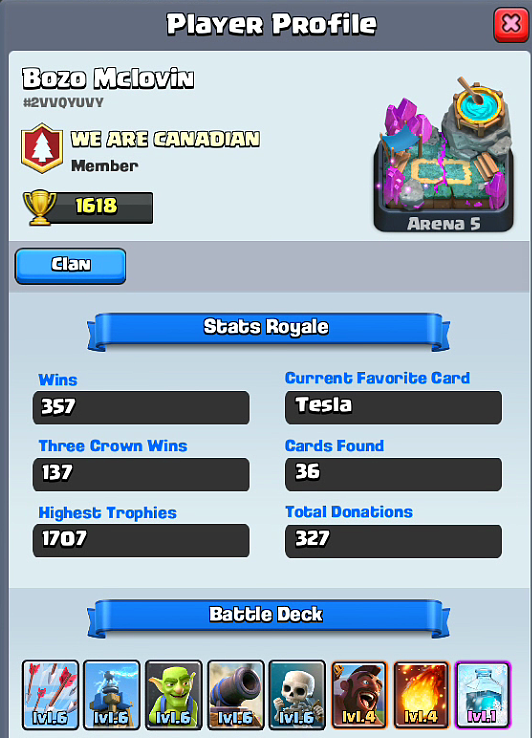 Here is a picture of my card levels at about 1600+ trophies. Make sure to get your Hog Rider as high level as you can. Always request Hog Rider cards from your clan. You want to be able to have your Hog Rider and Freeze card in your rotation to launch an attack. Since your deck’s only offense is Hog Rider + Freeze, you want to use it in creative ways so your opponent can’t easily predict when or where you will freeze. Freeze lasts about 5 seconds, so in that time, your Hog Rider will be able to do quite a bit of damage, as long as it stays alive. 2-3 good Hog Rider raids with Freeze is enough to kill a crown tower. That is all you need to win. The only tricky part is to anticipate where your opponent will put their defenses against your Hog Rider. Freeze can also be used defensively to stop opponent siege for 5+ seconds, buying you time to channel a Fireball or Arrows to wipe out opponent troops. 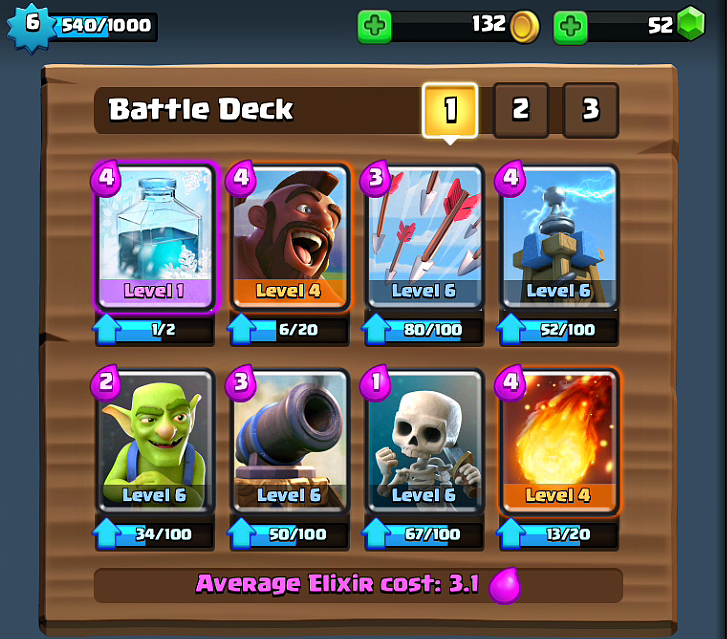 On defense, these mix of cards combined will be able to take out the Hog Rider quickly without much damage to the crown tower. You are welcome to use a pre-emptive Arrows on your second Hog Rider attack if you think they will use them again. If they like to drop them close to the crown tower, then you can Freeze them instead. Smart players will drop their small troops closer to the bridge so you can’t freeze them. These buildings are there to slow down the Hog Rider and preventing him from getting to the crown tower. I like to use fireball to reduce the duration of them and also deal some damage to the crown tower. Launch your Hog Rider + Freeze combo when a building is about to expire. These can be easily dealt with a Fireball and some well placed Tesla or Cannon. Against Prince/Dark Prince, I suggest dropping Skeletons and Goblins to distract them. 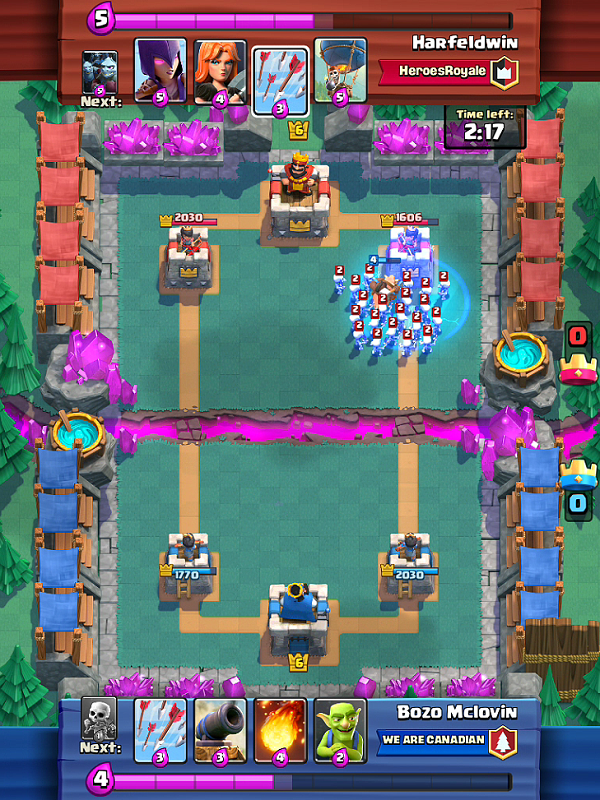 If your opponent has arrow, drop a building then either the goblins or skeletons behind them to distract them and avoid the pre-emptive Arrows. Knights, Musketeer, Baby Dragon and Witch are countered by both Tesla and Cannon. Out of all large troops, the Golem is the hardest to deal with. This only happens in high level arena(6+) though, so you don’t have to worry about it at lower levels. Giant and PEKKA can be tough if they drop ranged troops behind it. You want to drop your goblins and skeletons after they have used things like Arrows. Otherwise, you will be in big trouble if they wipe out your small troops. Use your Tesla and Cannon to distract them and pull them away from the crown tower. Get your Arrows and Fireball ready for the Minion Horde. Being defenseless against them is a no-no. A well-timed Fireball on a Minion Horde and other troops is the best counter you can have against your opponent and gain an elixir advantage. Below is a video of popular streamer and YouTuber Phonecats using this deck at legendary arena 8. Check it out. And most importantly, have fun!